Please be aware that the final stages of building work for the villas at The Polurrian Bay Hotel will be taking place from mid March until the end of August 2019. Rock View is a ground floor holiday home recently refurbished to a good standard. Located above the beach at Polurrian Cove on the edge of Mullion village. 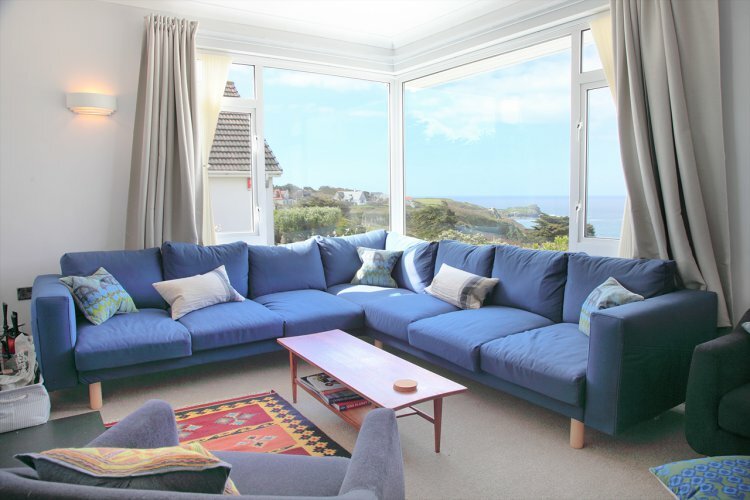 With off-road parking for two cars, complimentary access to the Polurrian Bay Leisure facilities, patio area, miles of cliff top walking from your front door and a marvellous sea view from the living room all make Rock View a lovely location for a holiday for up to six people. Mullion village itself has two pubs, two general stores, a pharmacy, beach shop and arty gift shop all around a half mile walk away. You can also take a more challenging route down the steep cliff path onto the secluded Polurrian beach, a beautiful golden sandy beach; only accessible by foot and therefore much quieter than some beaches. Continue Northwest a little further along the cliff path to reach Poldhu Cove (sandy beach, cafe, toilets) and you could continue all the way to Porthleven via Gunwalloe Church Cove and across Loe Bar taking in all the lovely scenery along the way. A short car journey will bring you to the market town of Helston with several supermarkets, pubs, restaurants and museum while the famous port town of Falmouth is 35 minutes away. Penzance, St Ives and Truro are all reachable in less than an hour. Entered from the sun-catching front patio area to your own entrance and into the hallway which has all rooms off. All along the front you can look out along the cliffs of Polurrian across to Mullion Island and out to sea. The kitchen is equipped with an electric oven with 4-ring ceramic hob, extractor over, a fridge/freezer, dishwasher, washing machine, microwave, kettle and toaster. The living/dining room has a large corner window for admiring the view, a smart TV, wood burner and plenty of comfy seating with a large corner sofa, two seat leather sofa and two chairs as well as a dining table to seat six. Please note there is a step down to the living area. Bedroom one is a double room with 6' super king, bedside tables and lights and a built-in wardrobe. Bedroom two is a twin room with two 3' extra long (6'6") single beds, bedside tables and lamps and built-in double wardrobe. The beds may be pushed together to provide a super king option, please advise when booking. Bedroom three has narrow twin 2'6" beds and another built-in wardrobe. The family shower room is fully tiled and has a shower cubicle with mixer shower, a toilet, handbasin and heated towel rail. There is also a separate toilet with handbasin. The nearby Polurrian Bay hotel has a restaurant and serves drinks. Access to the indoor and outdoor pool, gym and tennis court is inclusive with your stay subject to availability. Please note that the hotel is opposite to Rock View, whilst having great views past the hotel it does limit the view directly to the front of the property. Above Rock View is another holiday let: 'Sandpiper' sleeps 4 and can be let along with Rock View to provide joint accommodation for up to 10 people. Ordinarily the two properties are locked off from each other. Rock View has use of the front patio/garden area with a bench for admiring the view. Please note, the rear garden area is for use by Sandpiper guests and can be separated by using the folding fences provided to keep dogs from visiting them. Rental includes bedlinen, towels, central heating and electricity. One medium/large dog or two small well-behaved dogs are welcomed at £25 per dog per week but we politely request that dogs are exercised off the premises. Please be aware that there is a drop at the front of the patio, children and dogs need to be supervised. Children from age 5 and over are welcome, if younger please call to discuss before booking. This is a no smoking property. You can select from these options when placing your booking. They are mostly instructions for the housekeeper to tailor the property to your needs. Rock View is part of the Rock View & Sandpiper family of cottages, the other cottages are displayed below.